The reports, which police released after Freedom of Information Act requests from the media, do not appear to offer many major revelations about what investigators alleged was a hoax that the « Empire » actor perpetrated with the help of two acquaintances — brothers Olabinjo Osundairo and Abimbola Osundairo. But the 61 newly released pages do shed light on investigators’ interactions with the siblings — police put them up in a hotel for days because reporters were probing their home, and investigators continued to interview them there before a grand jury indicted Smollett — as well as a few other details. 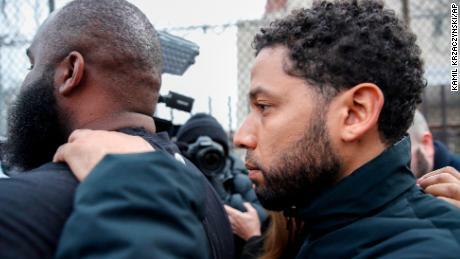 Police and prosecutors have previously detailed what they said was a plot by Smollett to pay the two brothers to attack him along a Chicago street on January 29, along with text messages, interviews and video that they said helped make their case. The newly released documents — obtained by CNN affiliate WLS — are supplemental police reports that classify Smollett as an « offender, » police Sgt. Peter Edwards said. It wasn’t immediately clear whether other documents would be released. Some names and addresses are redacted, but previous details that police released, as well as an unredacted mention of one of the brothers, make clear that the Osundairos are mentioned here. CNN has been unable to reach them. We previously knew that police — while investigating Smollett’s claim that two disguised people yelled anti-gay and racist slurs, hit him, poured bleach on him and put a noose around his neck — arrested the Osundairo brothers on February 13, interviewed them and then released them on February 15. On February 18, police announced the Osundairos were no longer suspects. Smollett’s charges were announced on February 21. The newly released documents say that during February 15-21, Chicago police put the Osundairos up at the Chicago South Loop Hotel. This was because reporters, having figured out who the Osundairos were, had been looking for them after they were released. « It was suggested that (the men) be placed into a hotel until the media frenzy subsided, » one of the reports says. The men checked into separate rooms, and « 24-hour surveillance and security was provided » by Chicago police. An FBI agent asked Chicago police for a copy of a search warrant that was issued relating to Smollett’s Apple iCloud account. The letter contained racial, anti-gay and political language, along with white powder and a drawing of a stick figure hanging from a tree, police said. The powder turned out to be over-the-counter medicine, police said. Police would later allege that Smollett was involved in sending the letter; that he was disappointed it didn’t attract more attention; and that he later plotted the January 29 attack to promote his career. Police continued to interview the Osundairo brothers while they were at the hotel, the documents say. During one conversation, a detective showed one of the brothers a picture of a hot sauce bottle. Police had found that bottle on February 7 during their investigation, the reports say. 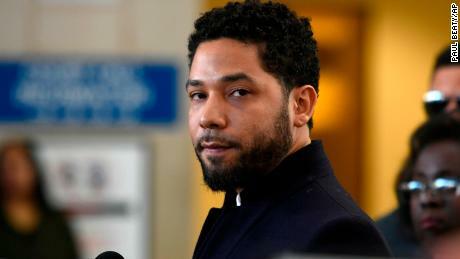 The brother that was being interviewed « stated that indeed was the bottle he filled with bleach and poured on Smollett, » one of the reports say. Police brought the Osundairo brothers to a court building February 20 — one day before Smollett would ultimately be charged — to testify before a grand jury. After one of the brothers testified, he told two detectives « that it felt good that he told the truth, but still felt that the Chicago police may want to charge him, » one of the reports says. As noted earlier, police had publicly said the Osundairos were no longer suspects. Smollett, on learning that he was going to be charged, turned himself in to police on the morning of February 21. « When asked if he would like to speak with police » ahead of his bail hearing later that day, « Smollett declined to answer questions, » one of the reports says. Smollett was taken to a lockup facility, where he was searched, fingerprinted and photographed. Then he was taken, by an unmarked police vehicle with tinted windows, to the Cook County Jail. While on the way, he was offered breakfast and something to drink, but he declined, the report says. At the jail’s receiving area, the actor stayed in the car — at a county jail officer’s request — while jailers cleared the receiving area of other detainees. A detective asked the jail officer, on Smollett’s behalf, whether the actor could be housed alone until his appearance in bond court later that day. The officer agreed. After the receiving area was emptied, Smollett went inside. « At no time, while Smollett was in custody (of Chicago police) was Smollett handcuffed, placed in a cell or subjected to the media, » the report says. CNN’s Brad Parks and Ryan Young contributed to this report.